While all of my blog posts are designed to be healthful and impartial and to save pet owners money, some may be seen as controversial – see my blog on dog foods, the timing of spay/neuter and the multiple options for ACL repair – this is NOT one of them. Universally pet owners and veterinarians agree that obesity in canines (and felines) is a major health problem that is getting worse, but is entirely preventable. You are not alone. According to research from the Association for Pet Obesity Prevention (APOP), 58% of cats and 53% of dogs in the U.S. were overweight in 2014. Obesity in pets is a growing problem and the repercussions are serious. Trust me if there is one thing that pet owners can do to save BIG money at their veterinarians - This Is It!!! Like us, weight gain usually happens slowly and very gradually. Simply put, obesity is the accumulation of excess body fat and because it is so gradual it can be difficult for us owners to notice that our pet has become overweight. In addition, our idea of a “normal” weight has changed for both us and our pets. The attached guide below from Nestle Purina provides a great visual example of the “Body Condition System” for dogs. While most owners believe their dog is too thin, the reality is quite the opposite. 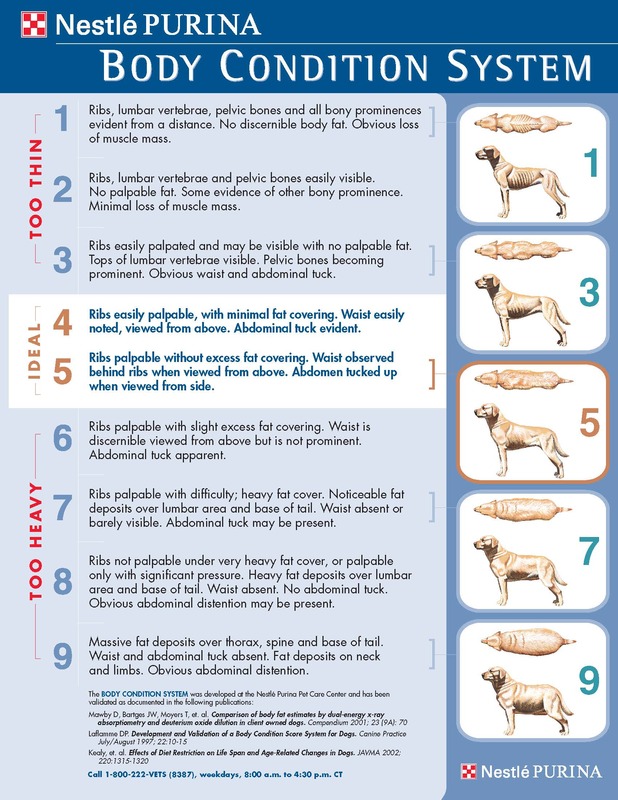 The Purina “Body Condition System” chart shows that the “Ideal” weight means that your dog’s ribs are (easily) palpable without excess fat covering – which means when you run your hands over your dog’s ribs you should be able to feel them easily. Most of us dog owners would think that if that was the case our dog would be too thin, BUT we would be incorrect. In fact, dogs are considered to be overweight when they are 10-20% above their ideal weight and obese if they are 20% or more above their ideal body weight. This happens because many of us dog owners equate food with love. For me it’s not extra food in the dog bowl but extra treats during the day. Fortunately, my wife (the veterinarian in the family) exercises all of the dogs so obesity isn’t a problem, but easily could be as I AM overfeeding. As pet owners there is nothing we can do about Metabolism, but we are solely responsible for Exercise and Feeding. Some breeds are more susceptible to weight gain than others – here is a link to the Banfield Pet Hospital report on Pet Obesity, it has some cool interactive features especially on snacks and calories https://www.banfield.com/state-of-pet-health/obesity – and all pet owners should know that having their pet sterilized also contributes to the slowing of that pet’s metabolism. Simply put, sterilized pets require less food to maintain a healthy weight. Pet owners should also be aware that in many cases the recommended daily feeding guide on most pet food bags or cans are for unaltered pets, so if your pet (cat or dog) is spayed or neutered, feed 25% less than recommended by the manufacturer as a starting point. Our veterinarians recommend feeding by body condition – can you feel the ribs easily, does your dog have a “waist,” is his belly “tucked-up” underneath as it joins the hind end? If any of these are a “no”, feed less. (see Purina study below). Note that this is NOT always the case and here is the link to an article that details how tricky it can be to ensure that your pet stays at ideal weight while getting all of the nutrients recommended on a daily basis (https://truthaboutpetfood.com/pet-food-feeding-recommendations-concerns/). I am NOT endorsing the editorial content of this site only THIS article. Every site on the internet has an agenda so be aware of that. If you bring your pet to your veterinarian regularly for a weight-in ask about obesity and the problems it can cause. But if that is not possible, always remember that nothing is more important than exercise (a daily walk is good for both us and our dog) and the appropriate feeding of a balanced diet. When Will I Know my Dog is Overweight? Likely when it’s too late – when your dog is already obese, or at least overweight. If you don’t weigh your dog regularly (and you don’t notice that layer of fat over the ribs) you likely have been normalized to the weight gain. Sadly, as the weights of both pets and humans have increased our perception of “normal” has also evolved. A CDC study released in 2015 showed that between 1960 and 2010 the average American woman went from 140 lbs to 166.2lbs and in the same time period the average American man put on an average of 29.2 pounds, going from 166.3 pounds in 1960 to 195.2 pounds in 2010. So, it’s not just a “normalizing” of weight gain with our pets, it is also a normalizing of our own weight gain (see chart at the end of this article). So Why is Obesity a Problem? As with humans, dogs carrying extra weight place extra demands on virtually all of their organs, and when these organs are overloaded disease and even death are the consequences. I will briefly discuss the most common consequences of obesity in dogs but this is, by no means, the definitive list of consequences. These are the complications we see most often at our practice. As one might expect extra weight puts extra stress on a dog’s joints. This can cause the cartilage in the joints to deteriorate, which leads to osteoarthritis(OA). It is believed that approximately 25% of overweight dogs develop serious joint complications. The risk of OA goes up with age as well as with increasing bone structure size, so the older and bigger the dog, the more likely it is to suffer from the inflammation and pain of OA. Unfortunately, dogs that are overweight or obese traumatize their joints over a very long period before we can see clinical evidence of the damage. It takes years of joint damage for changes from OA to show up on an X-ray. The end result is a visit to the veterinarian (me) and the transfer of money from you to me!! You will now likely need to buy pain medications from me for your dog (more transfer of money from you to me) but the best thing to do is have your dog lose weight. While there can be many causes of ACL rupture, too much weight is a well-known risk factor for tearing the ACL (anterior cruciate ligament). If this happens you will be visiting me again and you know the story – the transfer of more money from you to me!! As you know obesity in people is a leading cause of Type II diabetes and obesity is a well-known risk factor for diabetes mellitus in dogs. Obesity causes an increase in the secretion of insulin in response to the increase blood glucose level in the overweight dog. Insulin is also more in demand simply because there is a greater amount of tissue in an overweight dog. When requirements for insulin exceed the ability of the body to produce insulin, diabetes mellitus develops. If this happens you will be visiting me again, this time for insulin for your dog and you know the story, more money to me!! The real problem here is that controlling diabetes can sometimes be trick in dogs and very difficult in cats. This can be exacerbated by the shortage of insulin and the unstable pricing that results. As mentioned previously extra weight can put extra demands on all organs and these extra demands can result in numerous, albeit less commons problems such as: heart disease, high blood pressure (hypertension), liver disease or dysfunction and increased risks of developing malignant tumors (cancer). Other, less common problems are collapsing trachea and laryngeal paralysis, which if left untreated could lead to respiratory crisis that could be fatal. Not surprisingly these factors can lead to increased surgical and anesthesia risk. This risk should not be overlooked as obese dogs, as mentioned previously, are at higher risk for ruptured cruciate ligament which require surgical intervention to repair. The other major side effect of obesity is a shorter lifespan. A seminal study conducted by Nestle Purina in 2002 showed that feeding dogs a restricted diet extended their life span by 15%. Purina® conducted the first-ever canine lifetime diet restriction study and showed that dogs maintained in lean body condition throughout their lives can extend their medial life span by 15 percent – 1.8 years – for the Labrador Retrievers in the study. Our veterinary nutritionist will explain what this means when it comes to feeding your own dog. “We all know that obesity, whether in humans or canines, is generally bad for health," says Dennis Lawler, PURINA scientist and lead study investigator. "What's exciting about this study is that, for the first time in a large mammal, we have shown scientifically that by simply feeding to maintain ideal body condition throughout a dog's life, we can increase the length of life while delaying the visible signs of aging. That's powerful stuff." The 14-year study, which was started when the dogs were 8-weeks old, compared 48 Labrador Retrievers. Dogs were assigned to a control or lean-fed group. All the dogs ate the same 100 percent nutritionally complete and balanced diets for the entire study. The control group was allowed to eat an unlimited amount of food during the 15-minute daily feedings. Dogs in the lean-fed group were fed 25 percent less than the amount eaten by their littermates. Median life span was increased by 1.8 years, or 15 percent, in the lean-fed dogs compared to the control dogs. Median life span – the age at which 50 percent of the dogs in the group had died – was 11.2 years in the control group, compared to 13.0 years in the lean-fed group. The study showed that the lean-fed dogs maintained a significantly leaner body condition from six to 12 years of age than the control group dogs. On average, the lean-fed group weighed less, had lower body fat, and after a certain age, experienced a two-year delay in the loss of lean body mass as they aged, as compared to the control group dogs. “In addition, according to observations of the researchers, the control dogs exhibited more visible signs of aging, such as greying muzzles, impaired gaits and reduced activity, at an earlier age than the lean-fed dogs." So, reduce your dog’s caloric intake by 25% and increase lifespan by 15%! Remarkable really, and thanks to Purina’s 14-year study we have scientific proof that a restricted diet does result in a longer lifespan. In addition to an increased lifespan your dog will suffer fewer of the ailments listed above, resulting in a much better quality of life for both you and your dog. Always remember that an ounce of prevention is worth a pound of cure. My best advice is don’t let your pet become obese as it easier to prevent obesity than it is to reverse it. There are many diets to help reduce weight but a slightly reduced amount of food each day, no treats or human food and a regular routine of walking and exercise will get the job done in time. Some experts recommend a slightly less palatable food to help with weight loss. While some pet owners may believe this is cruel, it is not. If I only ate what I loved - burgers, fries and milkshakes - I’d have a serious weight problem as well. But my wife makes me eat brussel sprouts regularly, not my favorite by a long shot, but important for a balanced diet. Once an ideal weight has been reestablished you can return to a more palatable food.